The moon sets behind Mt. Whitney (elevation 14505 ft / 4,421 m), the tallest peak in the lower 48 United States. The moon illumination is 55%, with the brightest region overexposed in order to detect the subtle glow of earthshine. The distance from camera to the summit is 9.6 miles line of sight. Astronomy buffs will also want to read about former Lick Observatory Director W. W. Campbell's 1909 Expedition to the summit of Mt. Whitney, to make precise measurements which would definitively determine whether the atmosphere of Mars had a significant amount of water vapor (To Climb the Highest Mountain: W.W. Campbell's 1909 Mars Expedition to Mount Whitney, D.E. Osterbrock, Journal for the History of Astronomy, 1989, pp77-97). The peak immediately to the left of Mt. Whitney is Keeler Needle, named for the superbly talented astronomer James Edward Keeler (September 10, 1857 – August 12, 1900). He assisted Samuel P. Langley on the Mt. Whitney expedition of 1881, in order to precisely measure the Sun's radiation from a site above much of the Earth's atmosphere. Access to the summit was quite difficult in those days since the trail was not constructed until nearly a quarter-century later. Considerable scientific equipment was required, so the expedition camp was established and required observations were made from the relatively accessible Mountain Camp (11625 ft / 3543 meters). Nevertheless, Keeler and a companion hiked to the summit of Mt. Whitney and spent the night there, taking measurements of temperature and barometric pressure every hour through the night. Keeler reported that was "the most miserable night of my life." Keeler went on to make many important astronomical discoveries, and became the second Director of University of California's Lick Observatory. His extremely productive career was tragically cut short by a stroke and his untimely death at age 42. Thank you to Remington P. S. Stone for writing the above text. Raw image file data were adjusted, optimized, and sharpened for digital output. All images and text are property of Laurie Hatch Photography; unauthorized use is a violation of copyright law. You are welcome to email me with your usage requests. This image is available as a high resolution file sized at 3660X2373 pixels. A variety of croppings are possible, both horizontal (landscape mode) and vertical (portrait mode). Your inquiry is welcome. The waxing crescent moon punctuates Mt. Whitney (elevation 14505 ft / 4,421 m), the tallest peak in the lower 48 United States. 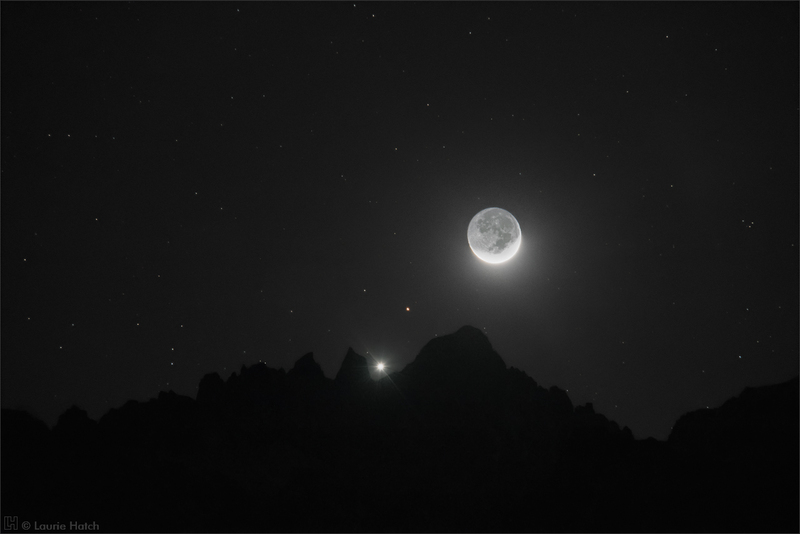 Venus is framed in the gap between Mt. Whitney and Keeler Needle to the left. Identified by its characteristic rusty glow, Mars is located between Venus and the moon. The moon disc illumination is 6%, with the brightest region overexposed in order to detect the subtle glow of earthshine. Distance from the camera to Mt. Whitney's summit is 9.6 miles line of sight. Two Lens flares in non-detail areas were removed using Photoshop Content Aware Fill. Raw image file data were nominally adjusted, optimized, and sharpened for digital output. The Milky Way arches above the famed Möbius Arch in the Alabama Hills (also known as Movie Road Arch, Alabama Hills Natural Arch, Galen Arch). Lone Pine Peak is distinctive in the distance at right. Near the far right border, the subtle outline of Mt. Whitney is visible. Bright stars inside the arch from left to right: Iota1 Scorpii, Girtab, Shaula, and Lesath.. This image is available as a high resolution file sized at 7360x4912 pixels. A variety of croppings are possible, both horizontal (landscape mode) and vertical (portrait mode). Your inquiry is welcome. The waning gibbous moon (95% illumination, 2 days past full) is diffused by thin clouds as it rises over the Alabama Hills. This view is looking directly south through the curvature of a fisheye lens at the famed Möbius Arch (also known as Movie Road Arch, Alabama Hills Natural Arch, Galen Arch). The bright star Sirius shines directly above the Arch. Jupiter appears even brighter high above the Arch, near the top center of the photograph. The familiar constellation Orion is between Sirius and Jupiter and slightly to the right. Framed inside the Arch is the open cluster Collinder 135, sometimes known as the Pi Puppis Cluster. Lone Pine Peak is in the distance at far right, elevation 12,949 ft/3,947 meters. If Mt. Whitney were visible in this picture, it would be seen to the right of Lone Pine Peak. Thank you to APOD authors & editors Robert Nemiroff (MTU) and Jerry Bonnell (UMCP) for featuring this image, and also to Art Neuendorffer on the APOD Starship Asterisk* forum who identified the Collinder 135 - Pi Puppis Cluster, in addition to posting Alabama Hills information. Comments by participants in the forum were both generous and thoughtful, and very much appreciated. The International Space Station streaks across the sky in this eight minute exposure from inside the complex Cyclops Arch, in the Alabama Hills near Lone Pine, California. The view through a fisheye lens extends from west on the left, to north at right. The apparent path of the ISS passes just below the north star Polaris. The waxing crescent moon, illuminated at 34%, is setting in the west at left below the distinctive 'eye'. Mt. 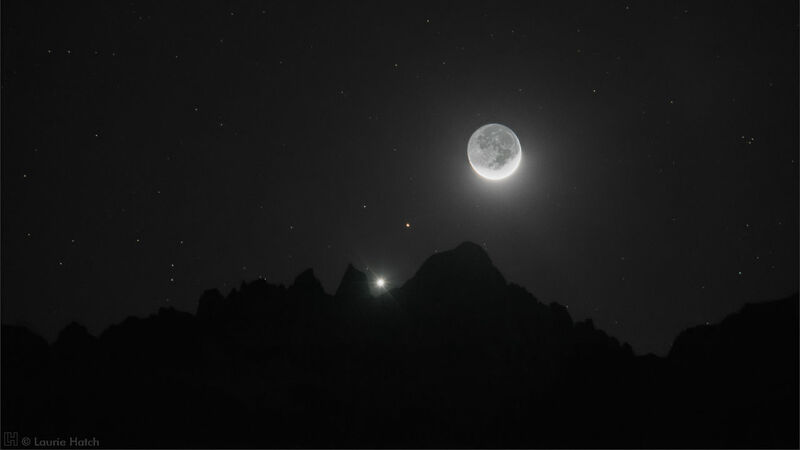 Whitney, the highest peak in the lower 48 United States (elevation 14,508 ft / 4,421 m), is seen at far left, with the bright reddish star Alphard setting immediately to the right of the summit. The faint horizontal streak of car headlamps is seen below the peak as the vehicle descends from Whitney Portal (7,851 feet / 2,393 m). Farther to the right along the ridgeline, Jupiter is dipping below the horizon. Just above Jupiter and slightly to the right, the bright stars Pollux and Castor are not far behind in their descent. The lights of the town Independence are seen farther right in the valley. Light painting was done inside the arch. In this view looking East-Northeast, the Milky Way has just risen above the horizon behind Cyclops Arch and surrounding Alabama Hills. Unseen behind the camera in its descent toward the western horizon, the waxing crescent moon at 18% illumination subtly brightens the landscape, and casts shadows on the distinctive granite formation. Vega is the brightest star centered in the sky. Smokey haze from a forest fire in Mariposa County (about 100 miles northwest) tints the sky a reddish brown color. At far right, the glow from lights in nearby Lone Pine brightens the sky above the base of the 'skull'. Minimal Light Painting was done on Cyclops Arch; Illumination is primarily moonlight. The date is Fall Equinox 2013 September 22, and the sun has just set behind Keeler Needle, elevation 14260 ft/4346 meters. Mt. Whitney is on the right, and is the tallest peak in the lower 48 United States with an elevation of 14505 ft/4,421 meters. Keeler Needle is named for the superbly talented astronomer James Edward Keeler (September 10, 1857 – August 12, 1900). He assisted Samuel P. Langley on the Mt. Whitney expedition of 1881, in order to precisely measure the Sun's radiation from a site above much of the Earth's atmosphere. Access to the summit was quite difficult in those days since the trail was not constructed until nearly a quarter-century later. Considerable scientific equipment was required, so the expedition camp was established and required observations were made from the relatively accessible Mountain Camp (11625 ft / 3543 meters). Nevertheless, Keeler and a companion hiked to the summit of Mt. Whitney and spent the night there, taking measurements of temperature and barometric pressure every hour through the night. Keeler reported that was "the most miserable night of my life." Thank you to Remington P. S. Stone for writing much of the above text. The waning gibbous moon sets behind Mt. Whitney (elevation 14505 ft / 4,421 m), the tallest peak in the lower 48 United States. Moon illumination is 67% of the disc. The distance from camera to the summit is 9.6 miles line of sight. This image is available as a high resolution file sized at 4288x2848 pixels. A variety of croppings are possible, both horizontal (landscape mode) and vertical (portrait mode). Your inquiry is welcome. The full "blue" moon sets behind Mt. Whitney (right, elevation 14505 ft/4,421 m) and Keeler Needle (left, elevation 14260 ft/4346 m), as the golden sunlight of early dawn illuminates the granite cliffs. Mt. Whitney is the tallest peak in the lower 48 United States. Astronomy buffs will want to read about former Lick Observatory Director W. W. Campbell's 1909 Expedition to the summit of Mt. Whitney, to make precise measurements which would definitively determine whether the atmosphere of Mars had a significant amount of water vapor. All images and text are property of Laurie Hatch Photography; unauthorized use is a violation of copyright law. You are welcome to email me with your useage requests. A classic orange-hued Mt. Whitney crowns snow-covered slopes in this view at dawn from the Alabama Hills.